this trip has been postponed until 5 April 2014. This trip has been postponed until further notice. 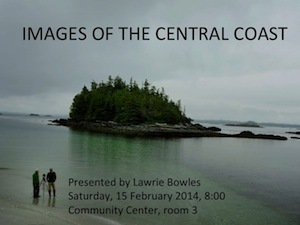 Description Quadra photographer Lawrie Bowles will be presenting his scenic and wildlife photos of the Central Coast taken on a cruise aboard the Columbia III. Everyone welcome – coffee and tea provided – baked goods by potluck. Place Quadra Community Center, room 3. Contact Info 285-3710; norris.weimer@ualberta.ca . Please contact the coordinator not later than Sunday, if you want to participate. Description This is a fairly flat, but quite long walk through forest and along creeks and wetlands to the Stramberg old growth trees. About 12 km, about 4 hours walking. Dogs? Dogs are welcome as long as they will stay by you or on a leash. Best to assume there are wolves in this remote area. Notes: Bring lunch and gear appropriate for the weather. Plan for wet walking.